Jean Douglas died peacefully in hospital on the 25th, July surrounded by her family, and the prayers of so many people who knew and loved her. Her husband, David, had retired as a priest in the diocese and they made their home in Blackrod, David occasionally helping with services and Jean resuming her Reader Ministry. They became firmly established in the Village and Church life and, amongst her many interests, Jean’s undoubted skills with a needle and artistic knowledge, fashioned in earlier years at Bolton School of Art, found a ready place in the Stitch and Knit group. The Blackrod Tapestry, along with kneelers, vestments, altar frontals and lectern falls here, and in previous churches, remain lasting legacies to the groups she joined. Jean was a true Lancastrian and lived a very full and interesting life, and from an early age was involved with Church activities, often responsible for starting and organizing them. She met David when they sang in the same Church choir and, following marriage and David’s call to the sacred ministry, training and ordination, they served together in various parishes in the diocese. With, by now four young children, all girls, who had inherited many of Jean’s characteristics – determination, forthrightness, sense of fun and zest for life, the Vicarages were known places of hospitality and friendship. She was passionate about the equality of women and helped promote their ordination, and her gifts and experience enriched the Mothers’ Union and a number of diocesan committees on which she served. 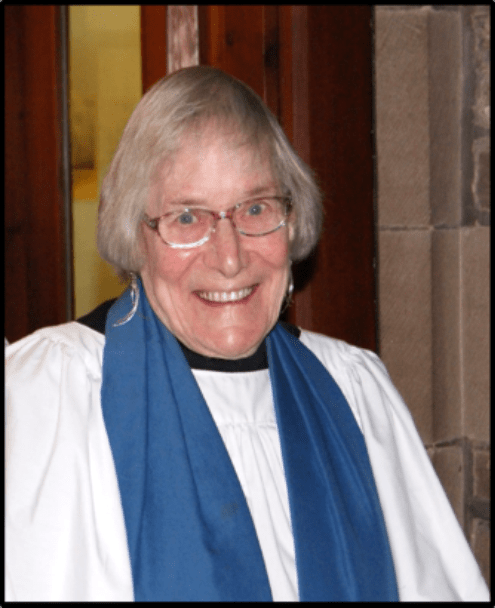 Here at Blackrod, her sermons were noted for their brevity, their down–to-earthness, their humour, and for usually finishing with some joke, the relevance to the sermon only Jean could fathom ! Her ministry here in so-called retirement saw her nursing and caring for David yet remaining faithful to Morning Prayer and Sunday worship, and, following his death in 2006, she resumed a number of interests that had obviously had to take a back seat. Until earlier this year Jean continued to preach occasionally, and exercise a ministry of hospitality and friendship. Loving God and loving neighbour were indistinguishable with Jean. Like most of us she was not without her faults and failings; she could be sharp and outspoken, but she held a deep faith that showed itself in practical outreach and a way of life that considered others often before herself or her family. Prepared, ready and unafraid to take the steps towards resurrected life, she shared these views with family and friends prior to going in hospital, for she firmly believed in Him who is the way, and the truth and the life . And from the Editorial Team – Many of you may not know that for many years Jean was a regular contributor to the Parish Magazine, not only with carefully written articles, but also as our proof reader – ensuring that this little publication went out each month without mistakes! Behind the scenes but not forgotten.